You remember to wash your hair but what about your hairbrush? It’s pretty safe to say, everyone knows to clean their house, clothes, car, hair and even makeup brushes. But you’d be surprised at how many people don’t know to clean their hairbrushes or HOW to clean hairbrushes. If you’re like many people, you probably pull hair from your brush from time to time and don’t give it another thought. But have you ever noticed the gunk lurking in the space where the bristles meet the surface? Hairbrushes can actually carry a lot of dirt, dust, oil, hair product, germs, and even dust mites! Gross huh?! With the proper cleaning routine, you can keep your hairbrushes looking their best for a very long time (they should last years). Today, as part of a new series, 10 Minutes Ideas, I’m going to show you how to clean hairbrushes . 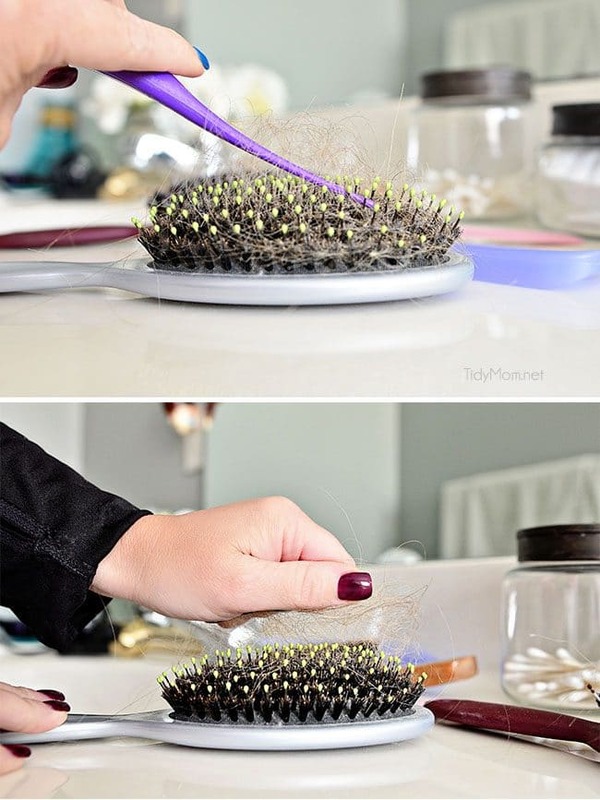 As gross as it all sounds, and may look, it doesn’t take much time at all to clean hairbrushes. 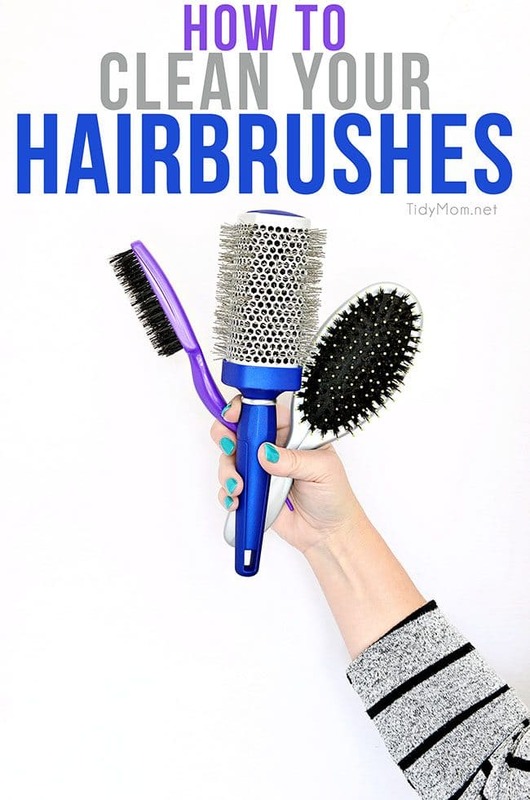 Your hair will be healthier since you wont be re-depositing the oil and dust back into your hair and your brushes will work better with out all the build up hair in them! For a standard flat brush, you want to use a teasing brush, hair pick, pen, chopstick what ever you can find to lift up as much hair as you can from deep down in the brush. Then, put it all out with your hand and throw away. 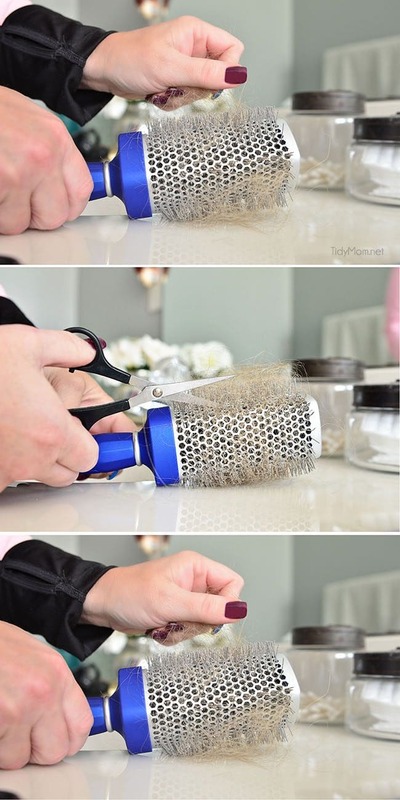 If you have a round brush, you will need to lift the hair out with your pick of choice, then use scissors to cut a seam, then you can use your hand to remove the hair and dispose in the trash. Fill bowl half way with warm water, add about 1 teaspoon of shampoo and a teaspoon of baking soda and use old toothbrush to stir. 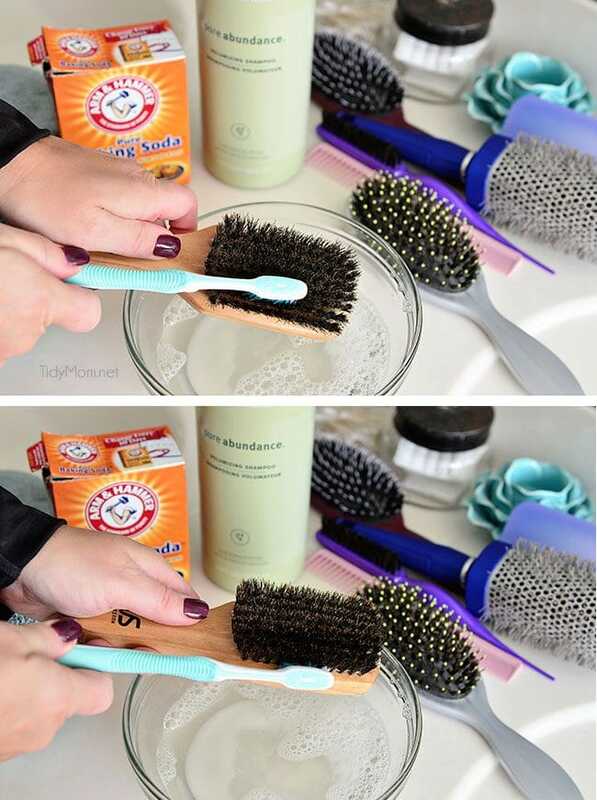 Hold the brush over the bowl and dip toothbrush in solution, and begin scrubbing the hairbrush base (or pad), making sure to clean the outer edge and bristles, dipping toothbrush into cleaning solution as needed. Rinse the hairbrush* under running water to remove any cleaning solution. When cleaning a wooden hairbrush, be a little more cautious about how wet you get the brush. I shake the toothbrush a few times before scrubbing, so I’m not soaking the wooden brush as much as I do with a plastic or metal base brush. *Rinse a wooden hairbrush carefully, trying to only have the bristles in the water, making sure not to get the wood part wet, as much as you can. 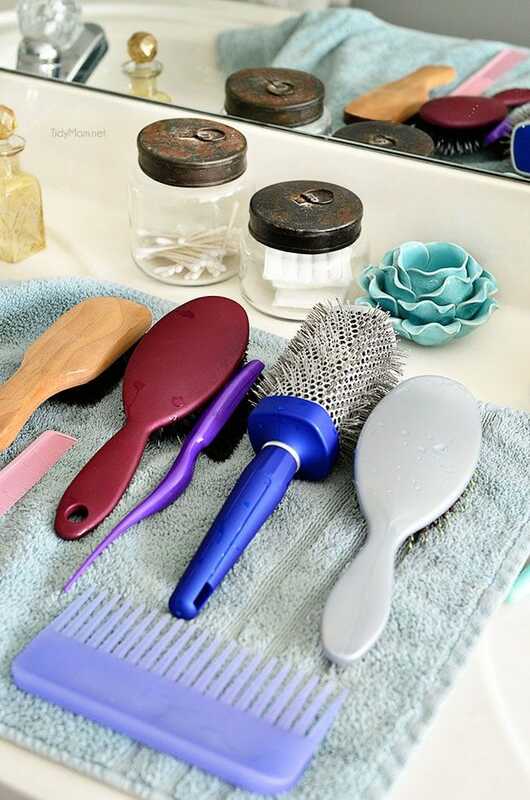 If you have several hairbrushes to wash, you can skip the bowl and fill the bathroom sink with your cleaning solution. 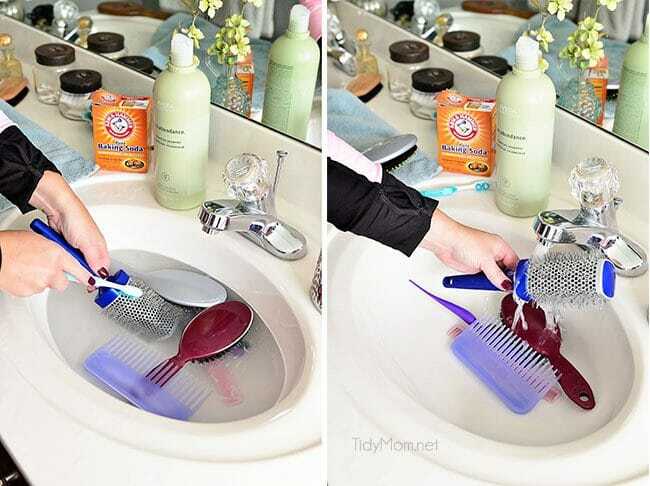 I toss all the plastic and metal brushes and combs in the sink and scrub them one at a time, drain the water and rinse. Sometimes if I’m in a big hurry, I will use the sink to soak the hair free brushes in a little warm water and shampoo while I put my make up on, then rinse. It’s not a good idea to skip the scrubbing if they are really dirty, but if you clean your hairbrushes on a regular basis, you can skip the scrubbing every now and then. After rinsing, lay them on a towel to dry!! and you’re done!! Ideally you should clean your hairbrushes about once a month, but if you don’t, try to at least shoot for every three months. I get my hair cut every six weeks, so I try to remember to clean my hairbrushes when I get my haircut, just because it’s and easy routine for me. 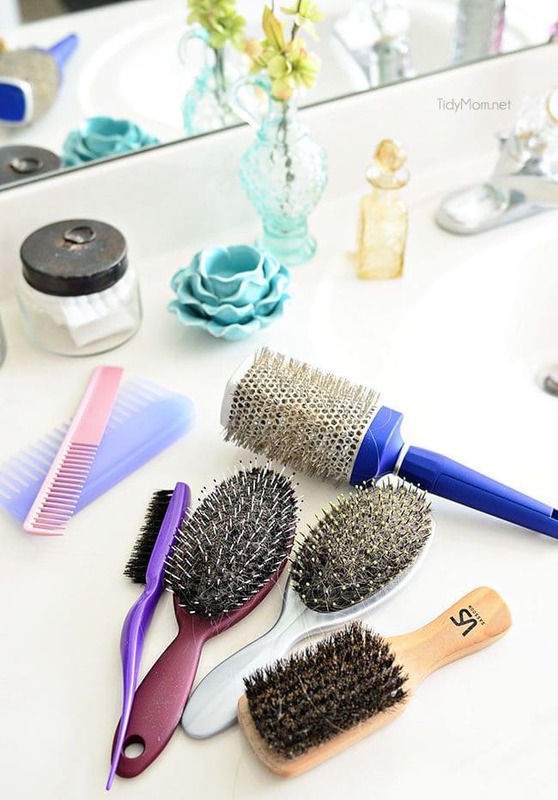 So let’s hear it……..how often do YOU clean hairbrushes? 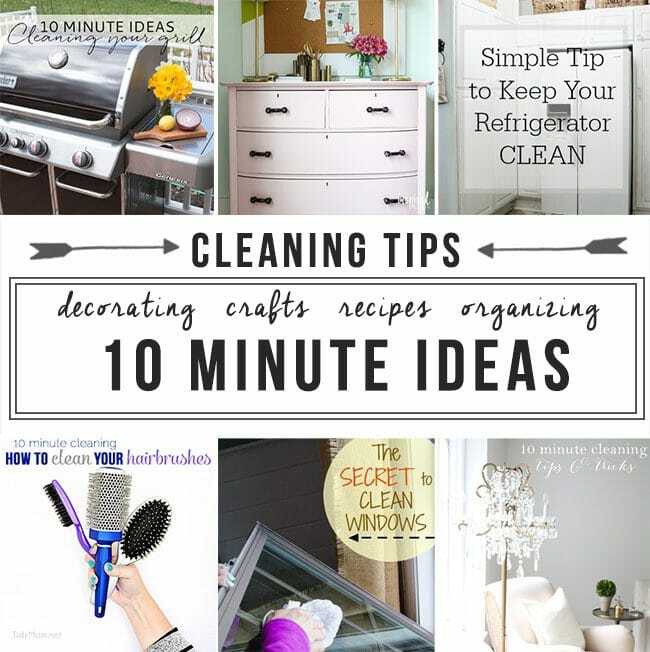 Each month, six bloggers will share a 10 minute idea with our readers, this month is 10 Minute Cleaning Ideas. 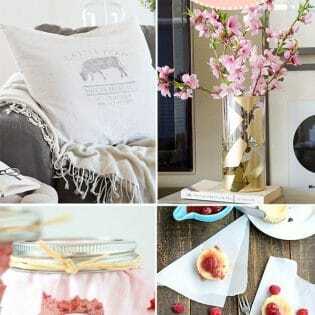 Follow the links below to 5 more fabulous quick cleaning tips!! So helpful! I need to do this! So, being a guy with not so full/long hair, I totally don’t have this problem. However, I still can appreciate good cleaning tips. Thanks for sharing! Thank you for this great tips! I’m happy to say that I do clean mine — maybe not as often as I should, but I get an “A” for effort, right? Confession – I have never really cleaned a hairbrush other than removing the hair and rinsing. Now you’ve got me thinking about all the money I could have saved it I hadn’t been replacing them so often! I always clean the hair off of my brushes and then put them in the cutlery basket in my dishwasher. Never with dishes, but usually with my husbands baseball hats on the upper dish rack. I always though that was the best and easiest way to get everything clean. I always just clean the hair out, but now you’ve inspired me to give my brushes a proper cleaning. We always used to soak our brushes and combs in a sinful of ammonia and water. I remember my mom teaching us how to do this when we were children. I think my daughter needs to read your post!!! 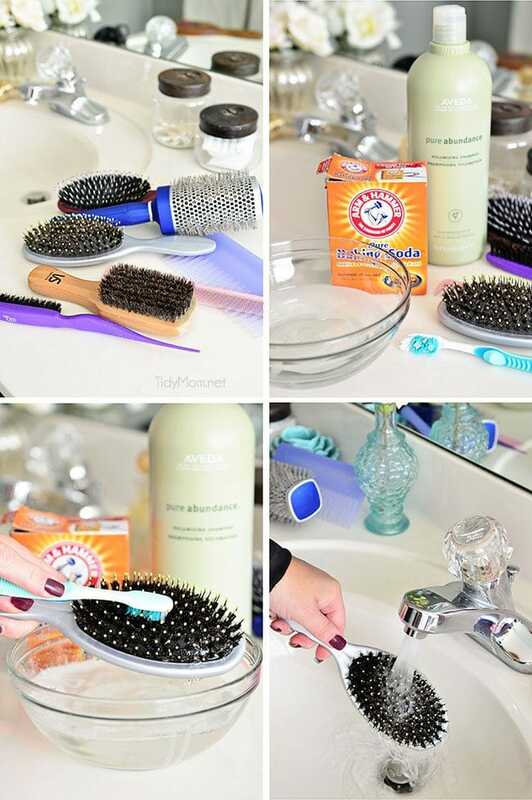 Great tips on how to clean hair brushes!Thanks,Cheryl, I’ ll definitely try this! You clearly live in a house of girls 😉 Great tips, Cheryl! I have short hair so I forget to do this for my daughters. 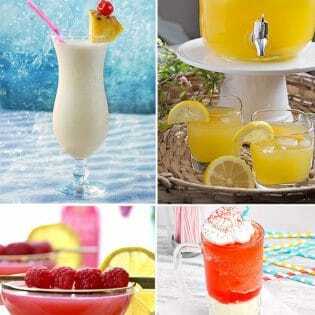 Cool post with very nice crisp pictures! I just pull out the hair and place the brush brush side down on the top rack of the dishwasher, along with all the water glasses I go through, and run it with the dishes. My dishes are pretty well rinsed first, so it’s not as if a bunch of food is going to get in the brush. And that dishwasher sterilizes EVERYTHING. Hi, Cheryl! Thanks for sharing this interesting post! I am doing my best to keep my hair brushes clean, but there is always what to learn. Glad to read your tips! I really enjoyed this tutorial, I have searched and seen so many on Pinterest, but none were “my thing”. On tuesday I also have a haircut, then I’ll totally take your advice into action! My mom showed me how to do this using a vinegar solution to soak in after cleaning. I wonder if that is as effective as using shampoo (brilliant!) with baking soda, one being a base and the other an acid? I have started cleaning my hair brushes in the last few years because my hair has changed and is much more oily than it use to be. I find that if my brushes get dirty they make my hair oily quicker because I am just re-introducing old product and oil every time I use a dirty brush! I haven’t used baking soda before and I’m excited to try that. It makes sense to break down some of the gunk. Thanks for the tutorial!